Rapid climate change and environmental crises raise new questions about the future of life on earth every day. Fortunately, McMaster has developed a unique program that prepares students to think more holistically about social and environmental issues. 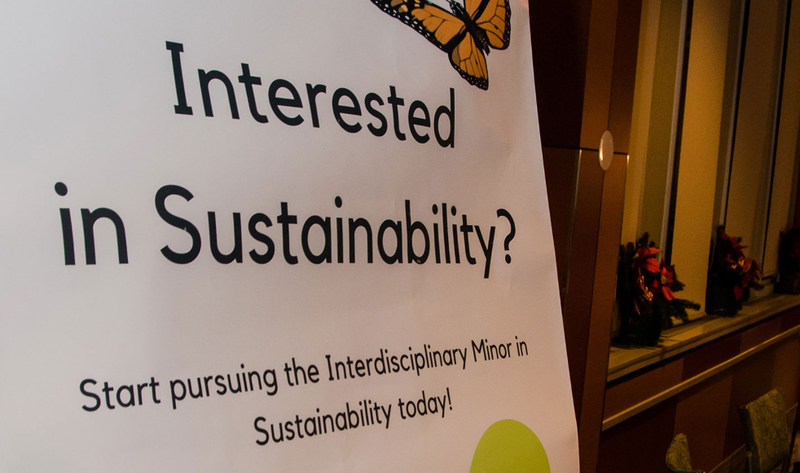 Implemented by the Academic Sustainability Programs office and hosted and supported by the Arts & Science program, the interdisciplinary minor in sustainability provides an opportunity for students to explore diverse aspects of sustainability in a holistic way by taking courses from different faculties and programs. These include Social Sciences’ “Anthropology of Food,” Business’s “Corporations and Society,” Science’s “Planning our Cities,” Engineering’s “Leading Innovation,” and the Arts & Science program’s “Environmental Policy Inquiry.” There are also a handful of courses offered by the Sustainable Future Program. “The genesis for the minor really came out of the notion that learning about sustainability should be self-directed, interdisciplinary and experiential,” says Kate Whalen, senior manager of Academic Sustainability Programs. The minor, which is the brainchild of Whalen and Dr. Brent McKnight, associate professor of strategic management within the DeGroote School of Business, has experienced steady growth since its 2014 inception. In fact, in just five years, 76 McMaster grads have minored in sustainability, and the number of program grads per annum has grown exponentially each year. As demonstrated at the recent SUSTAIN 3S03 Project Symposium, collaborations with local businesses and community leaders are generating important dialogue about sustainability throughout Hamilton. “It’s been exciting to see such strong support across the university for this minor, as well as the latent demand for it among McMaster’s student body,” McKnight says. Shunmathi Shanmugam, a Level II Arts & Science student currently pursuing a sustainbility minor, is thoroughly enjoying her experience thus far, especially its experiential, interdisciplinary nature. For her, the importance of working with other disciplines became truly apparent during a recent Engineers Without Borders event that she helped organize. She recalls being captivated by a talk delivered by art professor Judy Major-Girardin, who spoke about art within the world, and engineers, who talked about efficiency and function. The talk helped her realize how deeply the world is connected, and how important sustainability is to connecting many different elements. Siskos acknowledges that it’s likely unreasonable to think that sustainability will eventually become everybody’s bottom line. She says that people will always prioritize differently, so it’s up to people like her and her fellow graduates to help make sustainable living more natural and ubiquitous so that others can get on board more easily. And she says it’s always possible to do more. And while that’s exactly the type of thinking that the program’s administrators hope to inspire, they also hope it will have an impact on much more than personal choices and individual lifestyle.